Many inexperienced artists find that coming to terms with tones, colour mixing and the myriads of other complications with watercolour painting is so overwhelming that they almost feel like giving up. If you suffer from this syndrome then try working in monochrome for a while. This will greatly improve your tonal evaluation and get you back on the rails once more. By using just one colour throughout the painting you can concentrate on getting the tones right and not have to concern yourself with any of that nasty colour mixing that confounds so many. As usual, build up the watercolour starting with the lightest tones and gradually bringing in the darker ones. Try a dark colour such as indigo, Payne’s grey, burnt umber or warm sepia, though I have to be in a truly bad mood to use the latter as it’s such a depressing colour. The painting shown above shows the Eilean Donan castle in the Western Highlands of Scotland, which was featured in one of my very early books. It was carried out on tinted paper and is a lovely example of creating a landscape composition without resorting to colour. Monochrome also has the advantage of creating a sense of unity and mood. After a few monochromes try adding a second colour, gradually bringing in more colours once you feel more confident. 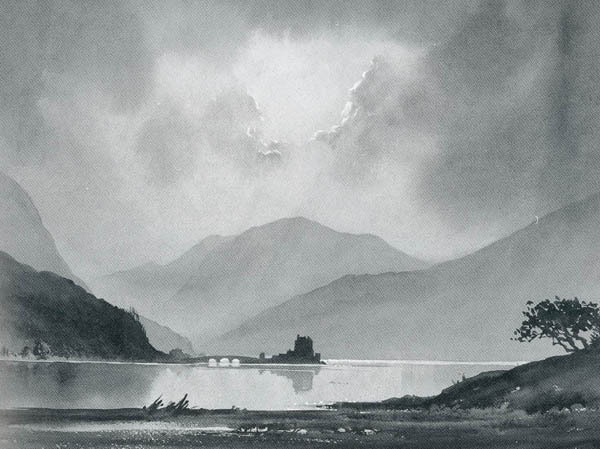 This entry was posted in David Bellamy, Watercolour monochrome painting by David Bellamy. Bookmark the permalink. Lovely monochrome study, David. The clouds are awesome! In one of your earlier books, which I got when I first started painting, you often used Karisma Acquarelle pencils for value studies and in complete paintings. I have struggled to find a replacement so I wondered if you had found anything that comes close?